This Twinchy Challenge was so much fun. The Twinchy pictured above is a block called “Black Beauty” It’s stitched in two shades of Watercolours, the dark one for the border and the lighter one for the main blocks. The center block is a coordinating metallic, and the background is a pastel thread (Watercolours in this case). 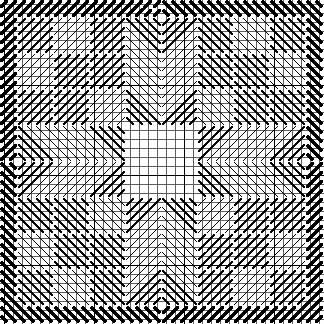 The chart shows the whole block except the center. You can make that any stitch you like, I used Leviathan. 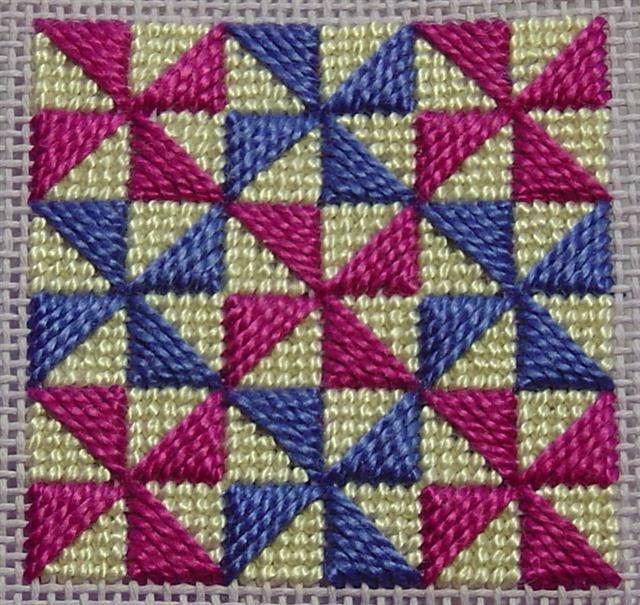 A smaller version of this block will be available in my new eBook, 50 Quilt Blocks for Needlepoint or Cross Stitch, out in September. Jan Fitzpatrick often stitches small quilt blocks for ring boxes. I Just love this version of Bear’s Paw. I love the way the four paws come together in the center to make a star. Jocelyn also had another three wonderful Twinchies, all in the prettiest pale colors. I’m enchanted with them and wish I wasn’t chained to my desk today so I could go make some more. Nancy White made this fantastic Twinchy. It’s based on a block which, as she puts it, is “not very elaborate.” But put many of them together and you get a wonderful quilt called, so descriptively, Broken Dishes. The chart for Stepping Stones. I’m still working on the chart for Log Cabin Leaf, pictured in the post from the beginning of the month and will post it as soon as I figure out why what was so easy to stitch such a pain to chart. I must have missed it somewhere along the way. Could you explain to me what a twinchy is please? or twinchies is? Twinchies are two inch square bits on needlepoint. The idea is based on a popular one from quilting and multi-media arts called Inchies, which are one inch square bits of art. The idea is that every month there is a theme, announced on the first of the month. Stitch one or more Twinchies on the theme. A Gallery is posted at the end of the month, just like this one, with my Twinchies, with charts, and pictures of or links to Twinchies from other people. Click on Twinchy in the category list to see all the posts on the subject. I love quilting and the folks involved.Thanks for sharing this. Sarah Jane….